Swimia.com wants your feedback on Aquagym in Leeds (City and Borough) to ensure all of the information and facts about swimming in Leeds (City and Borough) is valid. There are frequently discounts out there to senior citizens and tiny kids for independent swim. Find out by contacting your nearest pool among these Leeds (City and Borough) Swimming Pools. Thanks to some new pools submitted by swimmers like you, Swimia.com is increasing in the every day number of stored pools. Please don't hesitate to make contact with us in case you come across any Leeds (City and Borough) Swimming Pool with inaccurate or incomplete facts. Regular users in the following Leeds (City and Borough) Swimming Pools told us probably the most important thing about swimming would be to control your breathing. In some cases this is not attainable mainly because we raise the neck to breathe and the body isn't aligned. To avoid this, our head needs to be aligned with our spine all the time. Traveling to Leeds (City and Borough)? This really is the perfect spot on the web to discover places to swim in Leeds (City and Borough). Every day you will be not swimming you are losing precious time in improving your expertise to be a much better swimmer! No extra excuses! 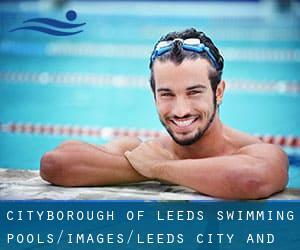 Find your nearest Leeds (City and Borough) Swimming Pool and tell us how it went. Do you know of any Swimming Pools in Leeds (City and Borough) that should really be listed here? Contact us!. There are several factors why you should choose a heated swimming pool in Leeds (City and Borough). Probably the most important 1 relies on the importance of keeping the body temperature stable. If the water is too cold, your body will try to warm it up and you will lose strength to swim appropriately. Enjoy the best indoor pools in Leeds (City and Borough) and don't worry about the weather. These facilities are open all seasons and you can enjoy a swim at the same temperature every day of the year. One from the advantages of outdoor swimming in Leeds (City and Borough) will be the possibility to sunbathe during the summer season. Taking it with added care, sunbathing is healthy due to the fact introduces Vitamin D into the body, so the perfect option seems to be switching in between indoor and outdoor pools depending on the season. If you're tired of getting eyes and irritated skin, finding a saltwater pool in Leeds (City and Borough) may be the solution. You should understand that the level of salt from these pools is nicely below the level of salt from sea water, particularly they're talking about a tenth or less. There are many alternative remedies to chlorination, with fantastic advantages that guarantee much better water quality in the pool. 1 possibility is the mineralizer, which purifies water naturally and considerably decreases the chemicals utilised and maintenance time. Try Chlorine Free pools in Leeds (City and Borough). Broad Lane , Bramley , Leeds , England , UNITED KINGDOM (Postal Code: LS13 3DF). This sports centre delivers 25 yards, Indoors. Contact information and facts for this Pool which include phone number and email address are number. Updated on 2019 The Green , Guiseley , England , UNITED KINGDOM (Postal Code: LS20 9BT). Swimmers like you reported 25 meters, Indoors. Phone number and email address are number for this Swimming Pool. Prince Henry Grammar School , Farnley Lane , Otley , England , UNITED KINGDOM (Postal Code: LS21 2BB). This sports centre provides 25 meters, 4 lanes, 3 feet - 6 feet depth, Indoors. Contact knowledge for this Swimming Pool such as phone number and e-mail address are number. Cookridge Lane , Cookridge , England , UNITED KINGDOM (Postal Code: LS16 7NL). Among all the activities offered by the centre, in case you are interested in swimming you'll enjoy 20 meters x 8 meters, Indoors. Just in case you wish to contact this Swimming Pool just before dropping by, we only know the phone number. The Ings , Wetherby , England , UNITED KINGDOM (Postal Code: LS22 5HA). Swimmers like you reported 25 meters, 5 lanes, Indoors. Phone number and e-mail address are number for this Swimming Pool. No. 21 The Light , The Headrow , City Centre , Leeds , England , UNITED KINGDOM (Postal Code: LS 1 8TL). This sports centre gives 20 meters x 8 meters, Indoors. Contact details for this Swimming Pool like phone number and e-mail address are number. Oakwood Lane , Leeds , England , UNITED KINGDOM (Postal Code: LS 8 3LF). This sports centre gives 25 meters x 12 meters, 7 lanes, Indoors. Contact information for this Pool such as phone number and email address are number. Updated on 2019 Scott Hall Road , Chapeltown , Leeds , England , UNITED KINGDOM (Postal Code: LS 7 3DT). Among all of the activities offered by the centre, when you are considering swimming you may delight in 25 meters x 12.5 meters, 0.9 meters - 1.6 meters depth, 0.9 meters - 1.6 meters depth, Indoors. If you have to contact this Swimming Pool, e-mail address and phone number are both number. 186 Otley Road , Headingley , Leeds , England , UNITED KINGDOM (Postal Code: LS16 5PR). Among all the activities supplied by the centre, if you are considering swimming you can appreciate 25 meters x 10 meters, Indoors. Just in case you desire to contact this Pool just before dropping by, we only know the phone number. Updated on 2019 Kirkstall Lane , Kirkstall , Leeds , England , UNITED KINGDOM (Postal Code: LS 5 3BE). This sports centre offers 25 meters x 12.5 meters, 6 lanes, 0.8 meters - 1.6 meters depth, 0.8 meters - 1.6 meters depth, Indoors. Contact facts for this Pool just like phone number and email address are number. Updated on 2019 Station Road , Kippax , England , UNITED KINGDOM (Postal Code: LS25 7LQ). Swimmers like you reported 25 meters x 12 meters, Indoors. Phone number and e-mail address are number for this Swimming Pool. It's difficult to visit Leeds (City and Borough) without having dropping by Morley (with 57.385 residents). Presently Swimia is showing you all the Pool in Morley and also the closest pools located in its vicinity. Holding an estimated population of 19.350, Horsforth is one of the most important cities in Leeds (City and Borough). Check all the Swimming Pool in Horsforth and its surrounding region. Let us tell you a secret to switch off even though you will be in Leeds: just opt for a Swimming Pool in Leeds and plunge into the water! There's no more successful process. Swimming is actually a exceptional idea to help keep your body active throughout your visit to Guiseley (Leeds (City and Borough)), or even in case you are a local. Swimia helps you to locate your closest Swimming Pool in Guiseley. Without a shadow of a doubt, swimming in Chapel Allerton is the greatest strategy to unwind immediately after work. Take a couple of minutes to browse Swimia's catalog to find a Swimming Pool in Chapel Allerton.